Brazilian president-elect Jair Bolsonaro will move embassy to Jerusalem, says Netanyahu, saying move a matter of when, not if. Israeli Prime Minister Binyamin Netanyahu said Brazil would definitely move its embassy in Israel to Jerusalem, calling the move “a matter of time”. Netanyahu said Brazil’s president-elect has promised the carry out the move, and uphold a campaign promise. Netanyahu arrived in Brazil on Friday and met with President-elect Jair Bolsonaro. The two visited a Rio synagogue together as part of Netanyahu’s five-day tour of the Latin American country, in honor of Bolsonaro’s inauguration on January 1st. During the visit to the Rio synagogue, Prime Minister Netanyahu told members of the local Jewish community that the Brazilian embassy in Israel would definitely be relocated to Jerusalem, calling the transfer a “matter of time”, UOL reported Sunday. In a statement released by the Prime Minister’s Office, Netanyahu recalled his conversation with Bolsonaro, during which the president-elect promised to move the embassy. “Mr. Bolsonaro also said this: 'I will move the embassy to Jerusalem. It’s not a question of if, just a question of when,’” Netanyahu recalled. “President Trump said the same thing. He moved the embassy. And President Bolsonaro will move the embassy as well. He accepted my invitation to visit Israel in the coming months and he’s going to do it, he says, by March. And I look forward to receiving him with the same spirit and the same brotherhood that he received me and that you are receiving us." It was earlier reported that a senior diplomatic official said that the issue of the embassy move had been raised during Netanyahu’s meeting with Bolsonaro, and that the move was a “matter of time”. "The subject of the embassy transfer was raised at the meeting. It's a matter of time. The situation is similar to that of President Trump - he declared and carried out later," said the source. Bolsonaro, who has been dubbed the “Trump of Brazil”, announced after his election that he intended to uphold his campaign promise and move the Brazilian embassy to Jerusalem. UOL has reported that Bolsonaro vowed the Netanyahu that the Brazilian embassy would be moved. 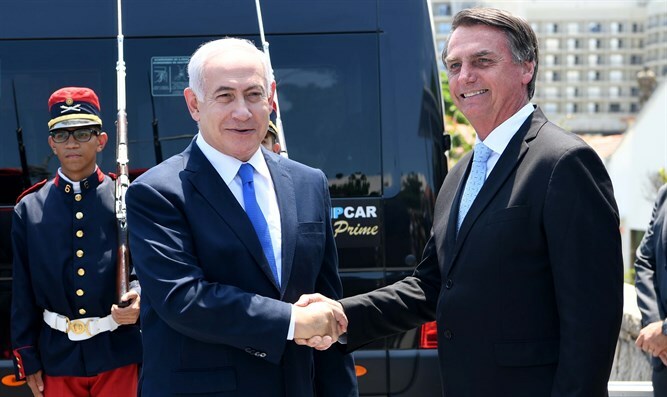 During their visit to Rio, Prime Minister Netanyahu invited Bolsonaro to Israel for a state visit after he takes office. According to the Prime Minister’s Office, the Brazilian president will visit Israel sometime before March 2019.